The following section has been developed to make it easy for people planning on visiting this year's Jefferson Dad Vail Regatta. Our hope is that your visit to Kelly Drive will be enjoyable and without problems. However, please call our phone number, or use our e-mail, if there are areas uncovered here. 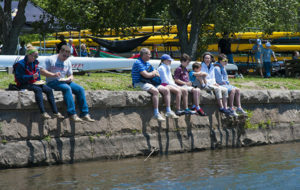 The Jefferson Dad Vail Regatta takes place on Philadelphia’s Schuylkill River about five miles northwest of Center City and two miles north of boathouse row. Running parallel to Kelly Drive, one of the city’s main rush hour traffic arteries between downtown and Northwest Philadelphia, the Drive is closed during regatta days. Traffic is routed through Fairmount Park by Police officers and barricades from both north and south and directed on its way. Regatta traffic is directed to remote parking areas. There, shuttle buses provide free rides for regatta fans and spectators down to the race course area, running about every 15 to 20 minutes. There usually is a nominal fee for parking. Due to limited parking on Kelly Drive, overflow pass parking, will be available at the Mt Pleasant parking area in Fairmount Park. Shuttle Bus service is available from this area and it is a short walk down Fountain Green Drive to Rower's Village. Shuttle bus service is available to and from the race course on Kelly Drive from 6:00AM until 7:00PM on both Friday and Saturday. This service is free of charge and will pick up from, and return spectators to, the remote parking lots as well as the Philadelphia Art Museum. The Art Museum, a short walk from downtown Philadelphia, is also accessed by SEPTA Routes 32 and 38, and is near historic Boathouse Row. If you drive, plan on parking your vehicle in the remote lots provided in historic Fairmount Park. To access parking, follow the directions to Kelly Drive elsewhere on this site. Once on Kelly Drive, there will be signs posted to the remote parking areas. Shuttle buses will pick you up in the parking areas. You will be minutes from the race course and Rower’s Village. The Shuttle route runs along the majority of the race course, with stops at the Canoe Club (mid race), Alumni and Festival Areas, the Grand Stands and Athletes’ Village before turning off of Kelly drive and towards parking areas with stops at every lot. The Shuttle Buses are white school buses and can be waived down at the specified points. The 2,000 meters long race course start line is just north of the Kelly Drive-Hunting Park Avenue intersection. The course ends at the Grand Stand finish line just above the Columbia Avenue Bridge. The course has six lanes and is an Olympic Length course. Programs are sold at the regatta. For race schedules, please refer to the Heat Sheets, which tell the reader the schedule of races and which schools rows when and in what lane. The Heat Sheets are published on this web site, and are updated for the Semi-Finals and Final races. Results will be announced over the PA System shortly after each race, mounted at the Finish Line Tower and published on the web: dadvail.org as soon as they are finalized by race officials in the Tower. Wear good walking shoes or bring a bike. Food Court: You'll find a great selection of food and beverages, incuding Philly favorites like cheese steaks and hoagies. Whether you need a quick snack, a hearty lunch, or a refreshing beverage, you'll find it at the Food Court. The Jack Kelly Statue and Grand Stand: This centrally located landmark at the finish line is one of the best places to see the excitement of the best college rowers competing for the championship. Rowers Village and Launch Area: Here rowers weigh in, congregate, eat, relax and await their turn to race. Vendors line the pavement selling goods for their rowing clientele. A limited number of parking spaces allow the vehicle of the handicapped person to pass through police barricades to park near the Grand Stand area. Wear your handicapped parking license or handicapped parking tag hanging from your rear view mirror. The Jefferson Dad Vail Regatta fully supports the efforts and directions of the The Philadelphia Water Dept (PWD) and The Fairmount Park Commission (FPC) to virtually eliminate floatable trash on our piece of the Schuylkill River, and to bring Philadelphia closer to our shared goal of being the greenest city possible. To this end, the Jefferson Dad Vail Regatta staff asks all competitors and spectators to make an extra effort to keep water bottles and litter of all sorts out of the Schuylkill River and in proper receptacles. Special Caution Must Be Exercised To Protect The Schuylkill River From Stray Water Bottles And Other Litter. Dispose Of All Litter In Any One Of the Numerous Trash Cans. Thank you for your cooperation and help with this very important effort. 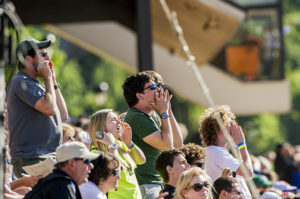 EMCVenues is the official housing and hotel company for the 2019 Jefferson Dad Vail Regatta. We are excited to work with our partner for housing and we encourage all of our participants to utilize this customized service. 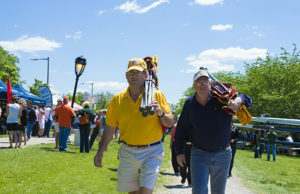 The Jefferson Dad Vail Regatta is the largest collegiate regatta in the United States, with over 100 colleges and Universities from the U.S. and Canada. 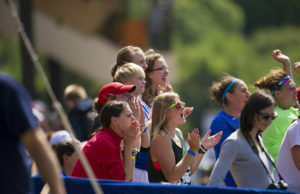 Thousands of student athletes gather to compete during the weekend of the second Saturday of May. © Copyright 2019 Jefferson Dad Vail Regatta Organizing Committee, Inc.